Election-related stress affected more than half of Americans, according to the American Psychological Association. If it’s true that our pets can pick up on how we’re feeling, your furry companion may have been riding a rollercoaster of emotions over the past few days. 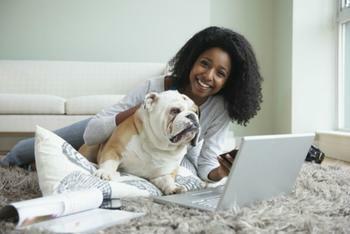 Now, you can help ease your pet’s stress simply by pressing play. With the help of animal behaviorists, More Than Pet Insurance has created several videos specially designed to de-stress pets. NYMag reports that the videos, which are narrated by David Tennant, calm pets by using sights and sounds that have been scientifically proven to be relaxing to animals. In the video for dogs (shown below), you might notice that the color is slightly off. That’s because it was shot in a dog’s color vision. Everything about the video, from the images featured to its slow pace, works to create a relaxing audio and visual experience for your tightly wound pup. More Than says its primary goal in creating the film "Woofering Heights" was to help reduce the stress that many dogs feel upon hearing loud noises or fireworks. There's also a video for stressed-out felines. Cats who feast their eyes on the film "Peer Window" (shown below) will be treated to images of swimming fish and trees just outside a window. The sounds of gentle purring and calming music accompany David Tennant's narration. Research has shown that different sounds and types of music can help calm pets. Classical music, especially, can help reduce anxiety in dogs, according to the Journal Veterinary Behavior. These videos aren't the first efforts to harness the power of music to help calm anxious pets. "Through a Dog's Ear" is touted as a form of music therapy for pets. It features slow, classical music that is said to help calm a nervous dog. Meanwhile, there are entire albums devoted to the idea that classical music and nature sounds can help calm cats. Earlier this year, PetSmart also jumped on the music-for-pets bandwagon. The retailer worked with Mood Media to create pet-friendly playlists designed to calm the nerves of pets staying at their PetsHotel. The playlists, as we reported, feature certain tones and textures that have been shown to help relax stressed-out pets.